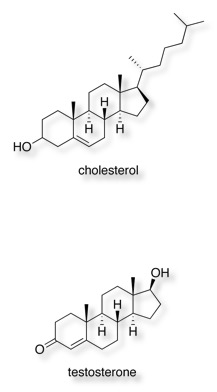 ChemSpotlight Review Whilst computers are pretty friendly when it comes to handling text or images when it comes to intelligently handling molecule files the chemistry is somewhat lacking. There are a large number of different chemical file formats each with a plethora of applications that can be used to open the file and visualize the contents. If you are like me you eventually end up with a huge number of files often with rather cryptic file names and identical or nondescript icons, and no way to quickly find the file containing the desired structure. Well hopefully ChemSpotlight created by Geoffrey Hutchinson is about to change all that, ChemSpotlight is a Spotlight metadata importer plugin for Mac OS X, which reads common chemical file formats using the Open Babel chemistry library. Spotlight can then index and search chemical data: molecular weights, formulas, SMILES, InChI, etc. 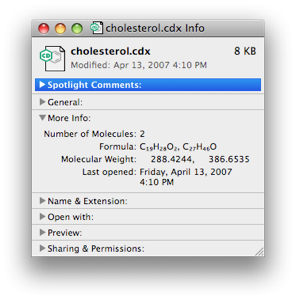 Once installed ChemSpotlight indexes chemistry files, adds molecular formulas (complete with subscripts and superscripts in the Finder), molecular weight, and a variety of other chemical meta information for Spotlight searches and “Get Info” windows. If you have a lot of structures this indexing may take some time (several hours!). If you now select a molecular structure file and “Get Info”, as you can see the “More Info” section now contains extra chemical information about the file. If there are more than one structure in the file the data for each of the structures is added to the meta data. The latest version 2.0 includes a QuickLook preview which allows you to view the molecular structure contained within the file, including live freely-rotatable 3D views of your molecules and 2D views of ChemDraw and MDL molfile formats, thanks to the brilliant ChemDoodle WebComponents. Simply select a file and hit the space bar to open the QuickLook window. The movie below gives a better idea of how this works. The ability to simply browse through a folder of a wide variety of chemical structure files in the Finder is absolutely brilliant and will transform how you search for chemical structures on your hard drive. Since ChemLook generates the images of the structures on the fly it is also possible to view the contents of files on remote servers.